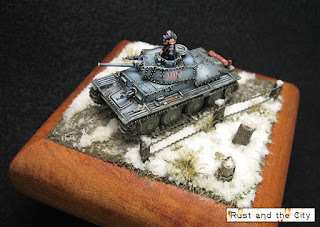 I painted this diorama as an entry into the historical model category at Attack-X in September. Attack-X is a small convention in Kamloops, BC that is aspiring to become the largest gaming convention in BC. 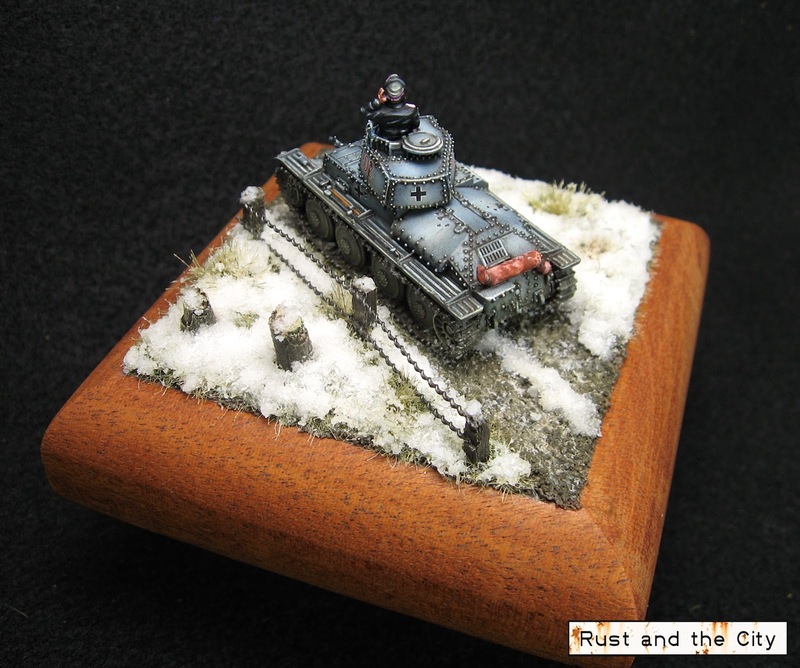 This year they have added a historical miniature category to the painting competition. 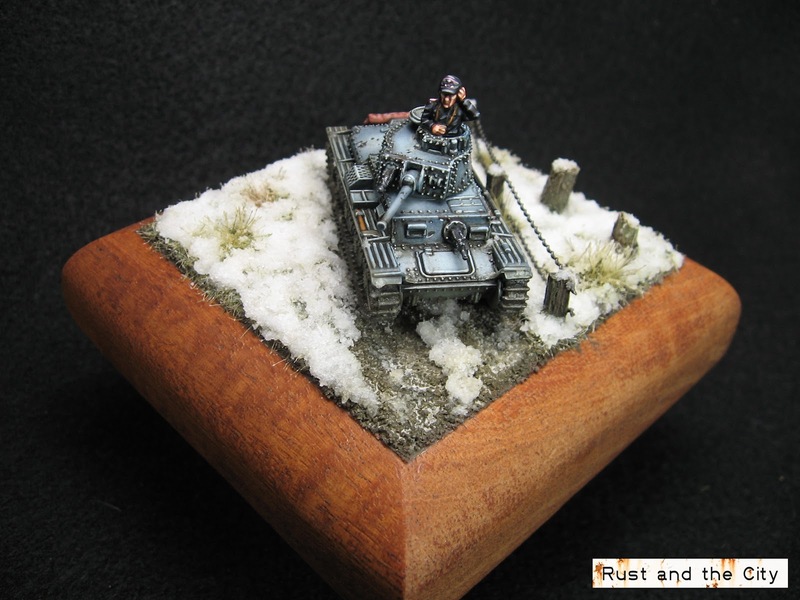 I decided this would be a nice opportunity to paint a one off miniature on a small diorama. 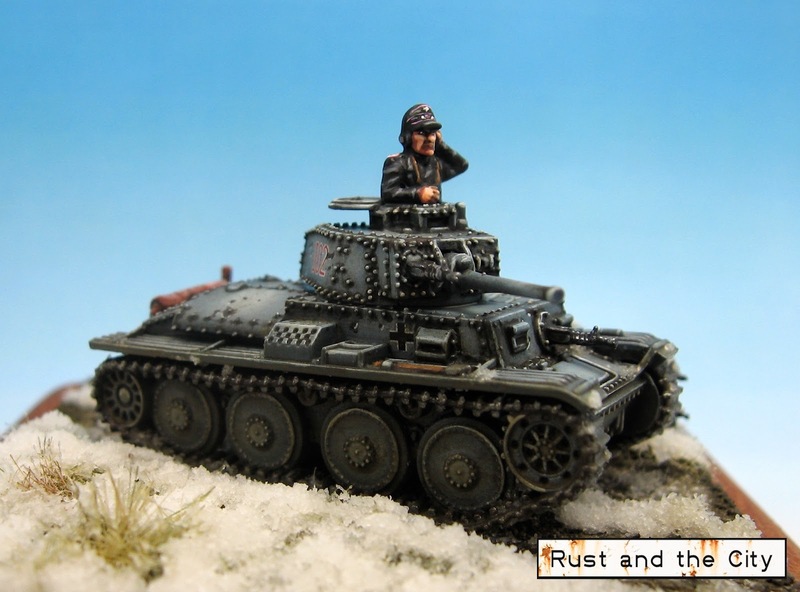 The model in from the new Plastic Soldier Company Panzer 38t kit. The kit makes 2 marder variants and the Panzer 38t. The kit was well cast with almost no mold lines that needed removing. The detail on the kit is quite astounding. There must be over 200 tiny little rivets on this model. My biggest complaint is that I think the kit is still too many pieces. They have moved to a full one piece track (which is great) but the hull and turret are many individual pieces. The main part of the turret has each side, back, and front as separate pieces. The pieces fit together very well but it would be nicer for assembly if there were a few less. I did an experiment with pigment fixer on the exhaust. It worked well but reacted funny with the varnish. I'll touch it up before the competition. This was the first time that I used the actual PSC tank commander from the sprue. PSC has been moving more towards the exaggerated detail of Battlefront style models recently. 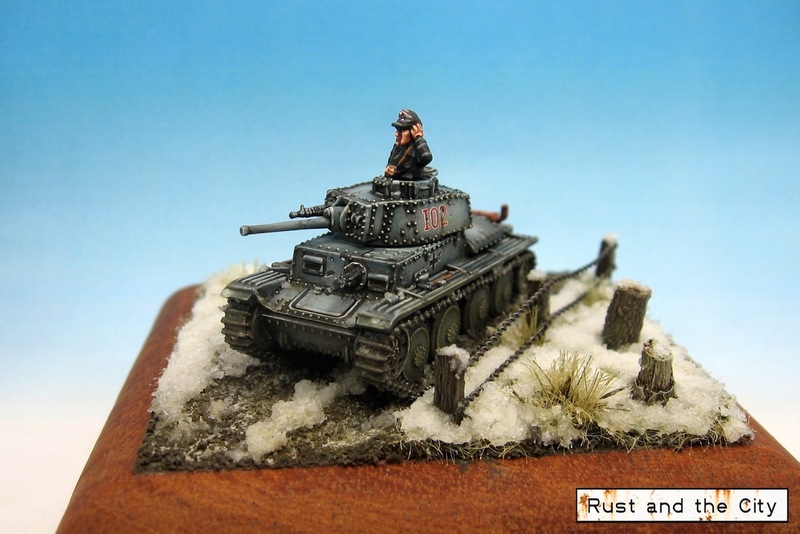 The detail on the crew is very good with some nice different styles of panzer wraps and things. The details are still much smaller than Battlefront's tank commanders. I painted this tank commander at the same time as some Battlefront ones. While painting I found it difficult to differentiate the parts of the uniform as the detail is not very pronounced one the model. The actual proportions are a little more realistic than Battlefront models. 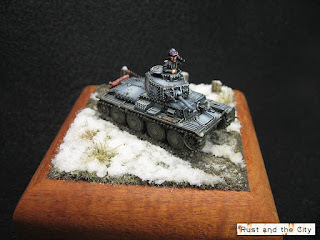 PSC tank commander. Details are smaller than on Battlefront tank commanders. I painted this model by roughly following the German Grey colours from the Vallejo AFV colour set (but buying the full colours I didn't already have). I really liked this set of colours as the colours all have a rich blue hue of grey. I primed the model black. I then airbrushed 71.054 Dark Grey Blue over most of the model. For this model, I used panel highlighting and airbrushed successively lighter patches in the middle of each panel. The next highlight was 71.053 Dark Seagreen. Next, I added a small highlight with 71.048 Dark Sea Grey followed by 71.046 Pale Grey Blue. Finally, I added a tiny further highlight with Pale Grey Blue mixed with a little white. The tank was very light at this point. 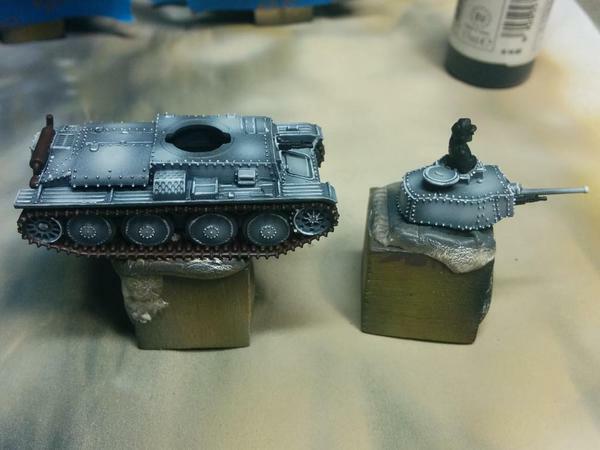 I added an edge highlight with a brush using the same mix as the final airbrush step. I then did a few layers of MIG filter for German Grey to darken and blend the colours. You can see how light the model was before the filter and washes. The base is made from a scrap piece of Mahogany wood. I used a router to add a rounded edge and then oiled and varnished the wood. 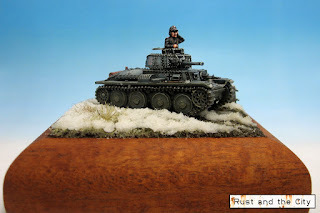 I masked off the sides while I modelled and painted the top for the diorama. 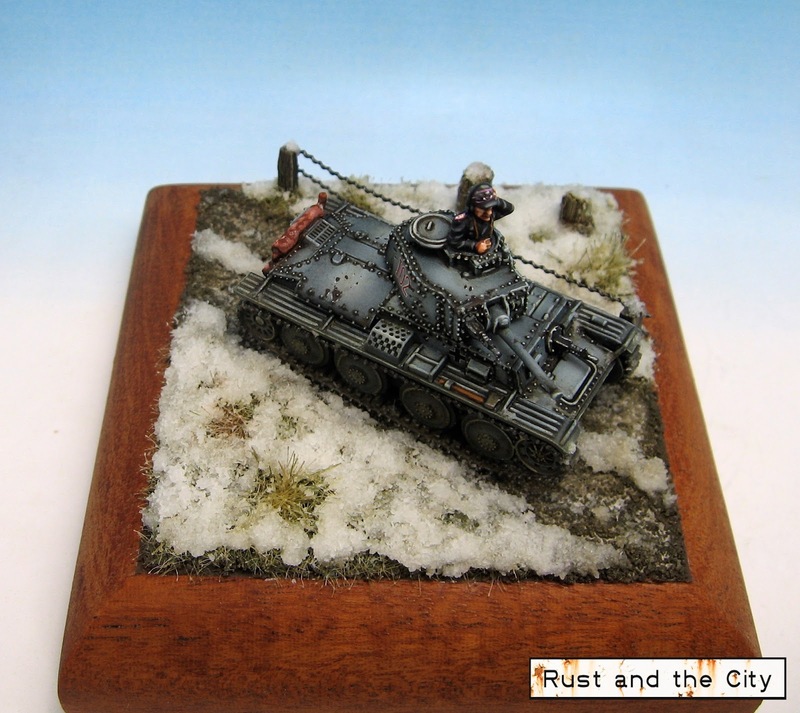 The idea for the diorama is a regimental tank driving somewhere in Russia during Operation Barbarossa. 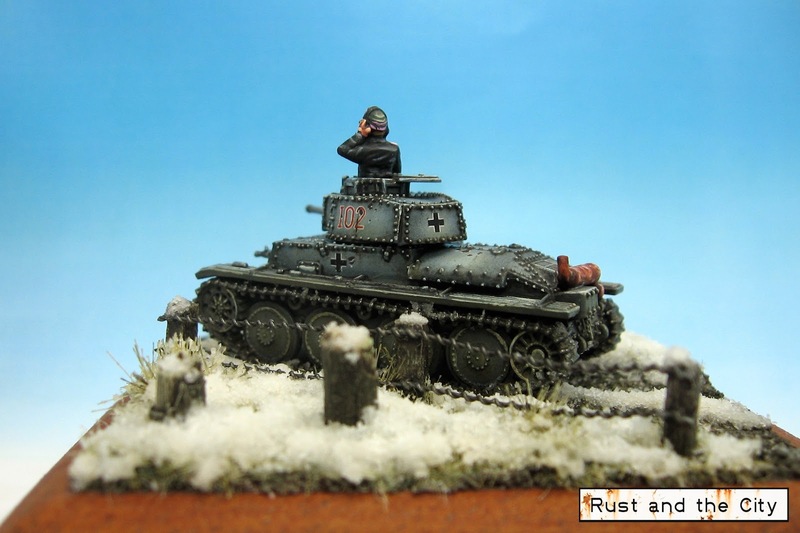 I wanted to portray the start of winter when everything has frozen and tanks can drive on the roads again. Well that's all for this blog entry. Constructive feedback on the model would be greatly appreciated. I had a lot of fun painting this one-off model and I have plans to do some similar projects again in the future. If you are on Instagram you can follow me at Rust_and_the_City for updates on projects I am working on. 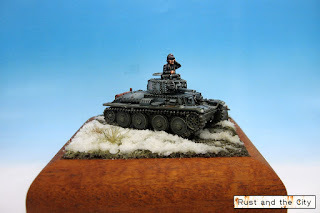 Check back in a few days for some pictures of some Panzer IVs and friends that I am finishing up. Thanks for visiting! Thanks Phil. Are you going to attack-x? You should enter something into the painting competition. Or even better, play flames of war :-). The mechanics models are neat. Lots of conversion potential. Do you do fantasy? What do you think of age of sigmar? I'm not a big fan of the empire models but we'll see how the full range looks. I think some of the chaos models might make nice cultists. And I think we will see some of the empire models as custodies or marines of some sort. There was a rumour that they are quite a bit bigger than standard fantasy, and that they will really not blend too well with the present mini line. I did get confirmation today from a rep that the next four months will be all fantasy. In October the new Tau codex will be coming out. It would be disappointing if they are bigger, as it invalidates everyone's existing fantasy collections. I guess we will see what happens. I won't be too affected either way as I haven't played fantasy for 3-4 years. Fantasy was my first game though and it holds a special place in my heart. Very nice! If I were to nit-pick, the rivets on the turret are a little light, but that may well be the effect of being under direct light and look less contrasting in real life. You might want a bit of black for the end of the barrel as well to simulate the muzzle opening, etc. But in any case, a lovely piece. Thanks for the feedback. I will add a dot to the end of the muzzle. 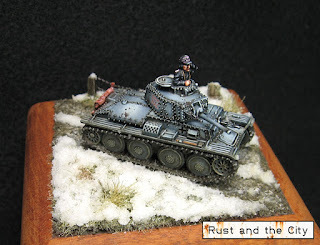 The rivets are tough as they are so small and close together that they kind of blend together a bit. I didn't keep enough of the dark colour overall on the turret. I think it looks rather good indeed Cameron. Thanks, Dai. I'm glad you like it. It was a lot of fun to paint. beautiful snow, I love that it looks half melted. Very realistic. I need to find some good snow materials for the Khador army I'll be working on shortly, what did you use (sorry if I missed that in the body of the post). I would say that because the snow does look like it is closer to water than ice, maybe try to muddy up the trail a bit more and get some grime on the tracks? Give it a real slogging through the mud look. Great paint job! Thanks oni. I thought about doing muddier but decided not to. The snow is woodland scenic realistic water mixed with gf9 snow flock. I think the snow came out fantastic. I also really like the panel sharing you did with the airbrush. Thanks Richard. I've only tried the panel shading a few times. It is faster than colour modulation. I'm still undecided about which I prefer. I like the 88 diorama you just finished. I'm hoping to do more dioramas in the future. They are fun. Dioramas are pretty fun to do, but time consuming for sure. 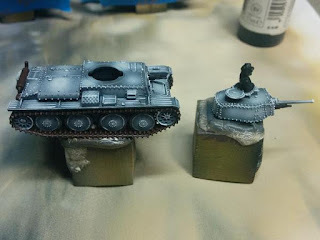 I'm going to try some new shading techniques on some German armored cars in the next two weeks, we will see how they come out. Cool. Airbrush shading? Feel free to post here if you have any questions and I can try to help. Thanks! The grey is modified from the Vallejo afv method. I really like the blue tone to the grey. The filter really ties it together too. Your painting's so rubbish. I really do not understand why you even bother to keep doing it. Ha ha. Thanks, I think :-). Nice '38! Was on my radar as a purchase for a few weeks now - looks like a great kit. You gave it real life! Thanks Troy. I think you would enjoy the model. It is very detailed. You would be a better judge of the accuracy of the model than I am. I looked at some of your models for inspiration on the panzer grey. Thanks! Looks like you are getting lots done for 6mmrpc. Stunning and inspirational work here!